If you can’t feed a hundred people, then feed just one, for love begins at home, and it is not how much we do… but how much love we put in that action. Smile at the riddles of life, knowing that life’s only true lessons are writ small in the margin. When Napoleon Bonaparte arrived in France in his early childhood, the French Revolution was in full swing. Peasants had wrestled control away from the nobility, and everyone was addressed as ‘citizen.’ The former hierarchy was no longer recognized. In fact, if former nobility referred to themselves by their noble titles such as Baron or Judge instead of merely ‘citizens’, they were sent to the guillotine. Anyone who thought themselves better than the ruling class were executed. The problem with that was that this began a sort of witch-hunt, people were being round-up and executed based on rumours and corridor-whispers, often as the result of envy or malice. This led to the execution of many innocent civilians during this period. Even Maximilien Robespierre, one of the founders of the revolution, had his head chopped off for not towing the line! In short, anarchy ruled. Someone needed to step-up and take control of this downwardly spiralling situation. That person was Napoleon. He brought back law and order and was very charismatic, gaining a huge following in the military as well as in the civilian population. The French Revolution was a very emotional issue for many, and Napoleon brought this back into normality, creating stability where before people were reacting from an emotional basis in their ruthless executions of so many who were perceived to consider themselves ‘better than’ the masses. It was under Napoleon’s influence that France became a dominant world power in Europe. 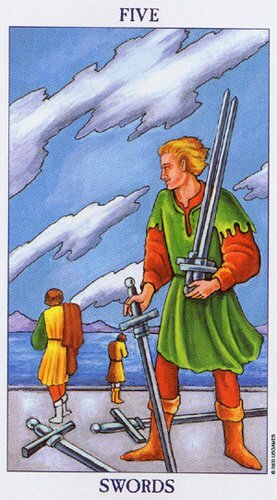 The Kings in tarot are generally indicative of having achieved a certain control of the element in question. 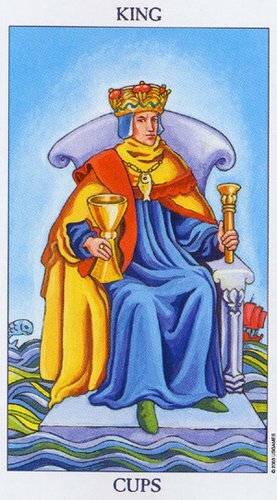 King of Cups is a solid individual who has gained control of his emotions through experience and wisdom. 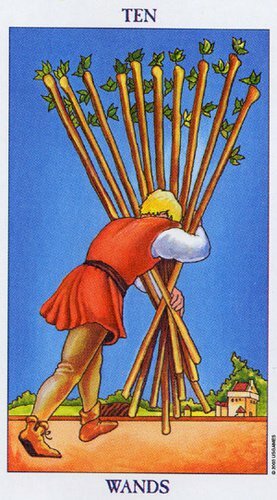 Today’s card therefore focuses on the realm of emotions, and prods us to examine whether we have become the ruler of our emotions yet, or whether they still rule us.